I couldn’t sleep on Wednesday night so I stayed up and made this card for my sister. My sister married into a family with a strong Irish heritage and they really do St. Patrick’s Day right! The idea I wanted to do for the card, the stamps I found and this weeks 2S4Y challenge all melded together perfectly. How often does that happen?! I found the digital stamps at The Cutting Cafe. 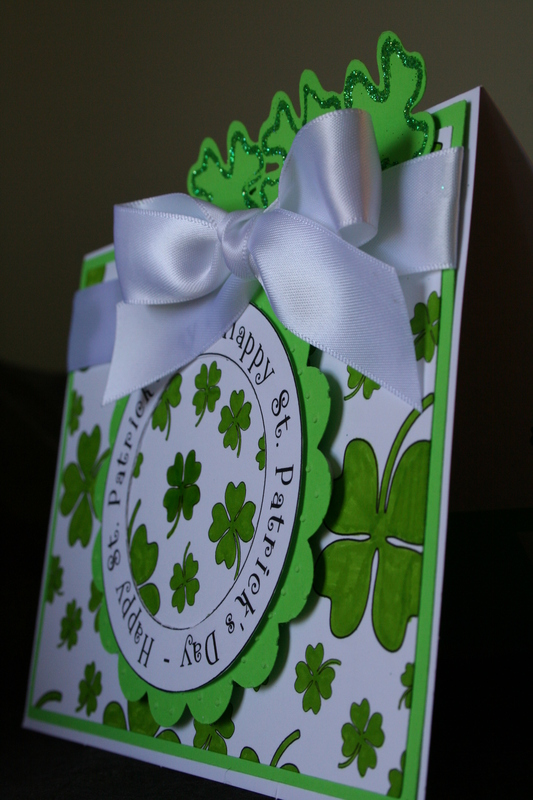 I “made” paper using the shamrock stamp which I then colored green. I cut the Happy St. Patrick’s Day stamp into a ring, and the Lucky Enough sentiment is from the same set. 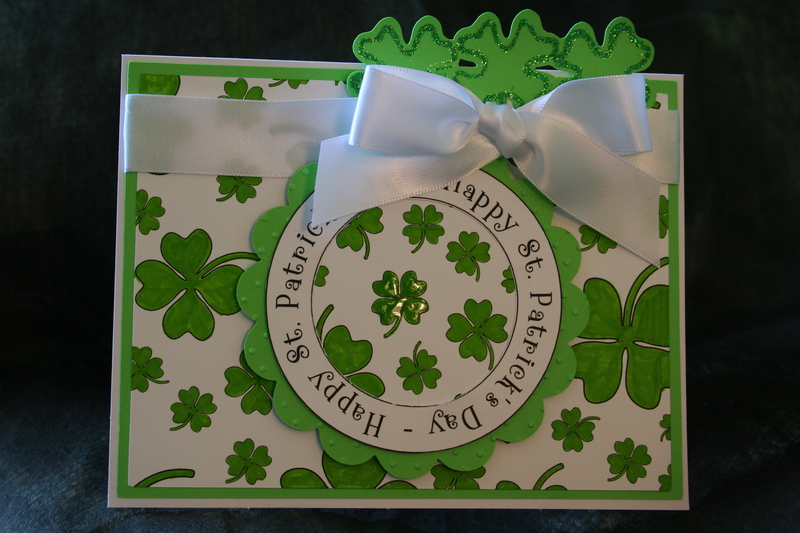 For the card I cut a 6″x 4.5″ rectangle out of the colored shamrock paper then layered it on top of a green 6.25″x 4.75″ rectangle. After, placed a white ribbon around the paper and tied it into a bow. I used a 6.5″x 5″ white base card. Then attached the layered paper. The green scalloped circle was cut from the Celebrations Cartridge at 4″ then run through my Cuttlebug using the dots embossing folder. 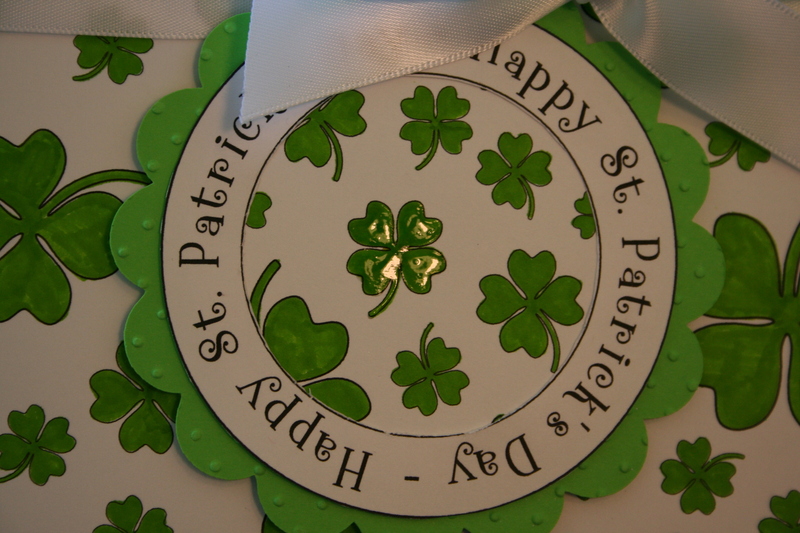 I cut a 3.5″ circle out of the shamrock paper using my Plantin Schoolbook Cart and centered on the scalloped circle. Finally, I placed the sentiment ring on top. I used Glossy Accents on one of the shamrocks in the circle for some added dimension. I secured it to the layered card with pop dots. 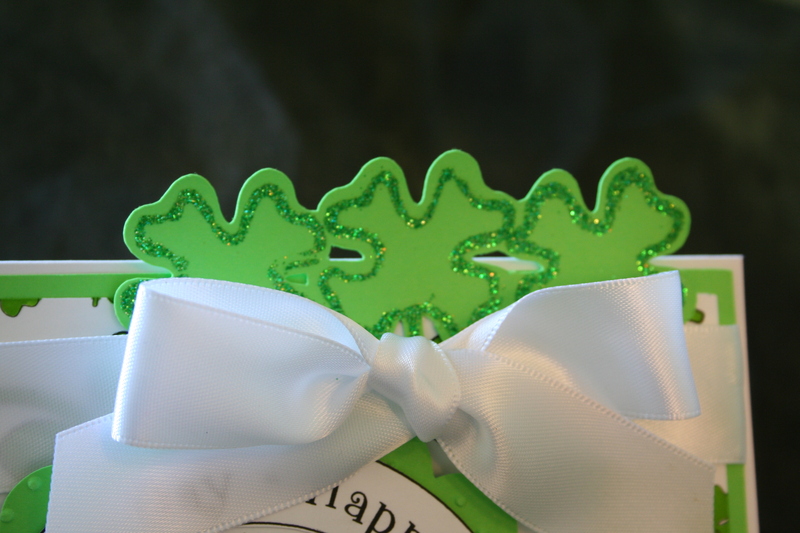 I used Design Studio to weld together 3 1.5″ shamrocks from the Designer Calendar cart. I used Martha Stewart glue and green glitter to spice it up a bit, then attached it behind the bow. 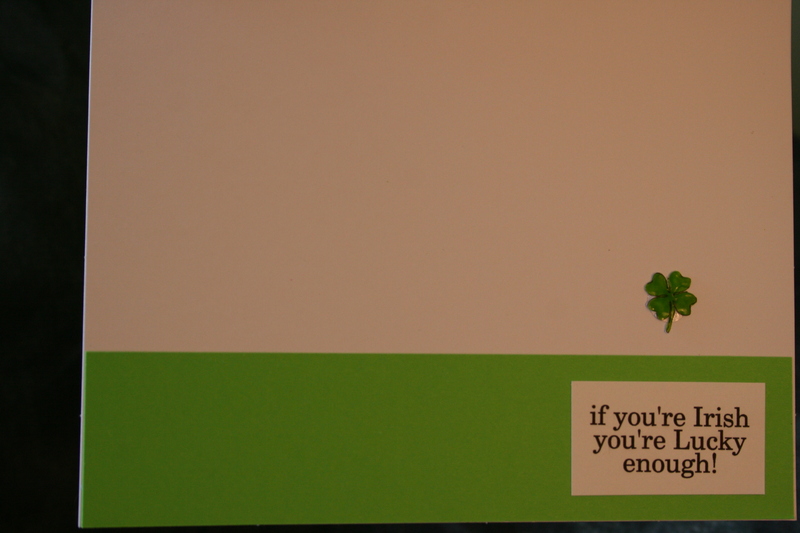 For the inside I cut a 6.5″x 1.5″ rectangle in green, then placed the sentiment over it. I used Glossy Accents on another small colored clover and cut it out to place above the sentiment.